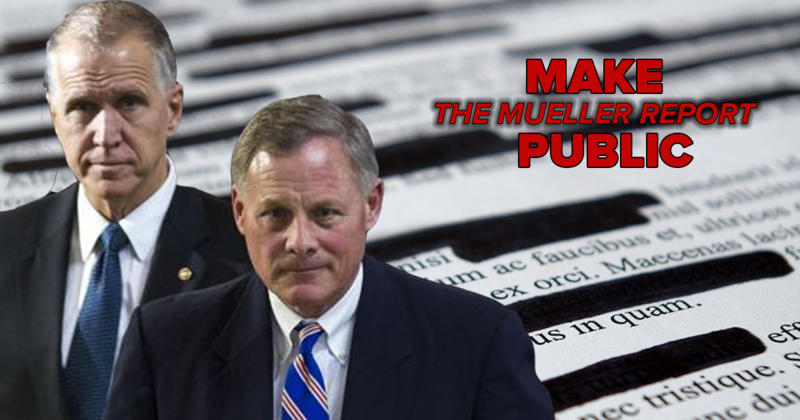 Tell Senators Tillis and Burr to make the Mueller report public. Recent polling shows that an overwhelming 90% of voters, including 82% of Republicans, say Mueller’s report and findings should be made public and available for everyone to see. 74% of voters, including half of Republicans, agree that Trump should not be allowed to decide to withhold portions of the report from the public. Americans have the right to see the full report into Russia's meddling in the 2016 presidential election. The majority of Americans, including Republicans, say that Mueller’s report and findings should be made public and available for everyone. The voters of North Carolina and the nation deserve to see the entire Mueller report and findings. Make it public!